It's easy for Yankee fans to get distracted by the shiny new toys they've been unable (or unwilling) to sign, but with Spring Training rapidly approaching, it'd be prudent to begin the process of getting jacked up over what they do possess. The team's got ​Aaron Judge, and that's very, very fun. He couldn't take the anticipation either, so he rolled up to Spring Training with the pitchers and catchers of the world to get his swing work under way. ​​Thing of beauty, even from a beat writer's camera 300 feet away. And Judge wasn't the only non-pitcher or catcher to roll up. One particular beefy first baseman is looking to make a good impression, too. Hello, ​King Louis! In Voit's first full year in New York, he knows he doesn't exactly have the first base job sewn up. And yes, his competition​​ showed up, too. Don't get it twisted. ​​We have no idea what to expect from Greg Bird, but we commend him for not resting on his non-existent laurels, after some strange comments made us question his motivations last year. 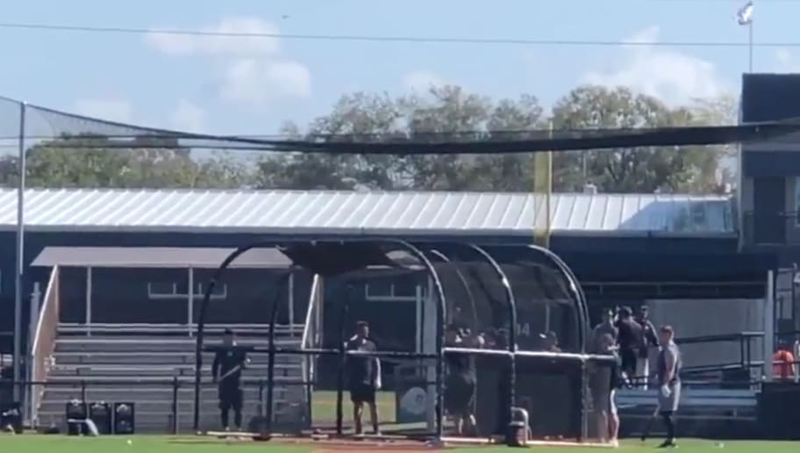 We'd love a closer-shot video, if possible, but for now, we'll assume Judge is shooting missiles and calling it a day.